Understanding the weaknesses employees have in their ability to engage effectively in team-work is beneficial in creating higher levels of organizational performance. As companies seek to develop new products and service the use of teams become important in putting to effective use the diversified skills. Certain weaknesses work in association with other weaknesses and can be used as a starting point to improvement. The use of work groups has become more common in modern times as a concept borrowed from Japanese manufacturers. The ideal employee is often seen as that person who is capable of working effectively in groups (Guffey, 2000). It is through this group effort that individuals are capable of hedging their skills to create stronger results through mutual synergy. The skills needed to be a strong group player can be elusive. Business leaders and employees alike can have difficulty understanding these concepts and defining them precisely enough to be of significant use. According to Ainsworth (2000) strong group skills include confidence in one’s abilities, interpersonal skills, open-mindedness, listening skills, and an ability to recognize the contribution of others. It is beneficial to see an example of the difficulties someone may create if they have not developed these attributes. Let us assume an employee named John is argumentative, seeks personal recognition above other group members, refuses to listen to varying perspectives, is set in his ways, and lacks personal confidence in his abilities. We might find John to be self-seeking and unable to come to agreement with anything that doesn’t recognize the “rightness” of his perceptions. Such a group is likely to disintegrate on the single influence of John and his personality. The more John is involved in the group the more likely it will become ineffective wasting time, cost and resources. John’s inability to develop proper teamwork skills will create an atmosphere where either poor decisions are being made to appease John or group resistance begins to form to thwart him. A single poor group member can impact the actions and reactions of the entire group and the effectiveness of the company. Business leaders and college professors can help improve upon people’s weaknesses by helping them find strategies to recognize areas of improvement and methods of overcoming these challenges. As students move into the business world they will be more prepared through the relevant instructional methods and self-awareness. Business and education can further recognize these poor skills and provide relevant methods of overcoming them. Due to this confusion of teamwork skills Schullery & Gibson (2012), from Western Michigan University, have conducted research on undergraduate business and organizational communication skills. The purpose of the study can be summed in a single sentence, “How well does, or can, the business communication syllabus address students’ group skill needs?” A total of 356 students participated in the study through four 15-week semesters. Students were asked to rank their abilities and skills throughout their courses. .-Factor 1: Shy, conflict avoidances, public speaking anxiety, and leadership seem to be associated. -Factor 2: Motivation, Oral Skills, and Brainstorming. -Factor 3: Impatient, Intolerant and dislike groups. The study helps to come to some important understandings that these skill deficiencies seem to travel together. For example, a person who is shy is not necessarily unmotivated. A person who lacks oral skills is not generally intolerant of others. Importantly, many of the students were aware of their skill weaknesses but have not developed abilities to overcome them. This inability leads to continued poor group performance throughout a person’s life. Let us move back to the example of John. His confrontational, self-seeking, and rude behaviors is most likely to fall into Factor 3 which means that these can be a result of poor skills such as impatient, intolerant and dislike of groups. In these poor skills he will have an impact on the nature and function of that group as he fails to compensate for his weaknesses. It is through proper development and training that employees can both recognize their weaknesses and learn how to overcome them. Ainsworth, S. (2000). Teamwork 2000: multifunctional teams help companies cut through bureaucracy and release creativity to improve their bottom line. Chemical and Engineering, 77. Guffey, M. (2000). Business communication: process and product. (3rd Edition). New York: South-Western. Schullery, N. & Gibson, M. (2001). 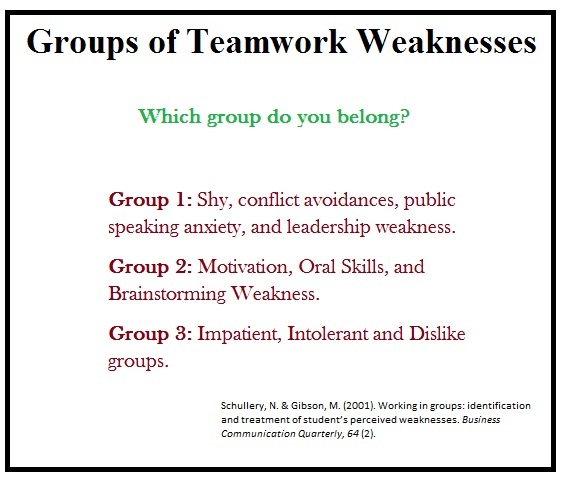 Working in groups: identification and treatment of student’s perceived weaknesses. Business Communication Quarterly, 64 (2).